Gomphocarpus (=Asclepias) physocarpus is a plant in the milkweed family (in the subfamily Asclepiadoideae of the Apocynaceae, formerly the Asclepiadaceae) often used as an ornamental for the striking yellowish, ball-like fruits. The name physocarpa comes from the Greek physa meaning bladder and karpos, fruit, referring to the inflated, bladder-like fruits. It has a plethora of common names including balloon plant, balloon cotton-bush, balloon milkweed, bishop’s balls, elephant balls, hairy balls, monkey balls, swan plant, and many others. This quick-growing, short-lived species native to tropical Africa is used as a seasonal annual in the Midwest, although it is actually a tender perennial (zones 8-10). It has naturalized in many places in the world, and is a weed in many areas with a mild climate. There is a very similar plant, G. fruticosus, which is less common in the ornamental trade. It is smaller in stature, not as vigorous, and the seed pod is slightly oblong (supposedly resembling a swan). But the common names of “swan” and “balloon” plant are used interchangeably for both species. The leaves are narrow and lanceolate. Balloon plant is an upright, herbaceous plant or soft shrub that can grow over 6 feet tall from the fibrous roots. The slender, single-stemmed trunk has multiple hollow, pale yellowish green branches. 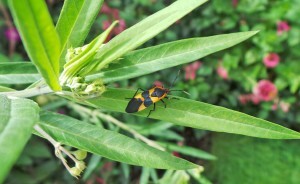 The smooth textured, light green, opposite leaves are 3-4 inches long. They are narrowly oblong to lanceolate. All parts of this plant exude milky white latex that is mildly poisonous if ingested. Pendulous clusters of small, waxy flowers with a faint vanilla scent are borne in leaf axils primarily in summer. Each flower is about ½ inch across, with five strongly reflexed petals arching over the corona composed of pouched lobes that develop from the petals. The petals are white to cream-colored while the corona is suffused with pink or purple. The corona surrounds a staminal column enclosing two carpels, the tips of which are united and enlarged to form the style head – a yellowish, 5-lobed disc in the center of the flower (a cyme). The anthers are fused to the style head and the pollen is held in two waxy pollinia (pollen sacs). 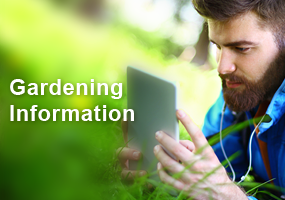 This plant is self-incompatible, so it requires pollen from a different plant to set seed. The flowers are visited by many different insects, but are only pollinated by vespid wasps and hornets. When the wasp visits a flower, the leg or mouthparts get trapped so the pollinia get attached to the insect, and when it visits another flower it gets trapped again so the pollinia are detached to pollinate the new flower. The unusual waxy flowers emerge from tight buds (L) and may be all white (R) or suffused with pink or purple (C). The pods are covered with long hair-like spines. 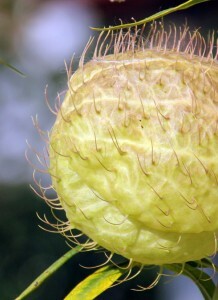 Flowers are followed by unusual fruits that look like hairy, inflated spheres. The pale green, soft, almost translucent, bladder-like follicles, covered with soft hair-like spines, swell to up to 3 inches in diameter. The follicles become yellowish, often tinged with red or brown, when mature, and very gradually split open to release the numerous brown seeds. Each smooth, flattened oval seed has a tuft of long, silky hairs (a pappus) at one end which aids in dispersal by wind. Cut long stems with pods to use in fresh and dried floral arrangements. 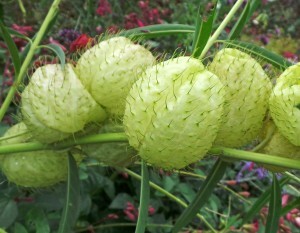 The softly spiny pods (L) become inflated (C) and eventually release the seeds, each with a hairy pappus (R). 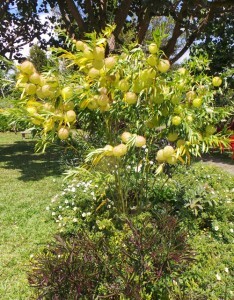 The unusual fruits add texture and interest in the garden. 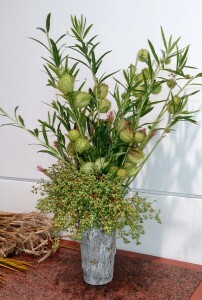 Stems with pods can be cut to use in floral arrangements. Balloon plant is an unusual addition to a mixed bed, the back of an annual border, as a specimen plant, or in large containers. 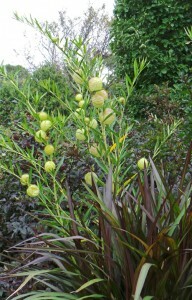 The unusual spherical fruits add interest and texture, and the flowers, although not particularly showy, attract butterflies. The plant itself tends to have a vase shape when grown as an annual, but can grow quite large, so position it appropriately. 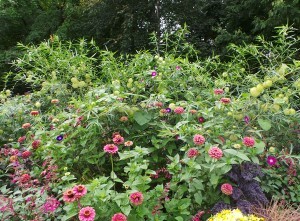 Or grow in the cutting garden just for cutting the stems to use in floral arrangements. Gomphocarpus prefers full sun and sandy, well-drained but moderately moist soil. Plants may be slow to develop and bloom too late in our short growing season to develop the distinctive fruits if grown in partial shade. Monarch caterpillars may feed on the foliage, and aphids can sometimes infest plants, but deer do not favor this plant. Place balloon plant behind shorter annuals. Although it is a perennial and could be overwintered indoors in bright light, this plant grows best if replaced every year, as it tends to get large and scraggly after the first year. 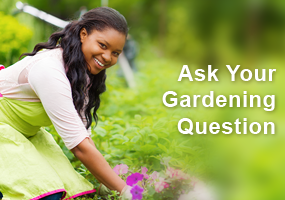 Collect seed from ripe pods just as they burst open. Balloon plant is easily propagated from seed. Ripe seed is readily collected from the fruits as they start to split open. If frost threatens before the seeds ripen (120-130 days are needed for maturity), branches with large pods can be cut and kept in water to give the seeds more time to mature. Sow indoors 6-8 weeks before the last frost to transplant into the ground when the soil has warmed and all threat of frost is past. Barely cover the seed, as light aids germination. Seeds should germinate in 1-3 weeks. Plants can also be propagated from stem or leaf cuttings. I live in Northern Indiana, my friends and I do a Topiary class every year at this greenhouse in Kalamazoo Mi. We always have a great time and after the class we shop. I saw these plants and bought four of them, 1 each for my girlfriends, kind of as a joke since they were labeled as hairy balls. Each of us planted them, and were amazed because the flowers are so cool and they attract hummingbirds and butterflies. My plant grew to four and a half to 5 foot tall. what was really amazing was the Monarch butterflies laid eggs and they hatched. So cool to see this. Took about 4 weeks after the caterpillar spun its chrysalis. in about 2 weeks I had Monarch butterflies emerge, so cool to watch. After this the seed pods or ( hairy balls) started to propagate on my plant and I have to say they are so cool lookin! I kept the pods and dried them out over winter and I intend to start them inside so they’ll be ready to plant after our last frost! If you’ve never had one get one and experience the beauty of this plant. This plant is in the Tarrant County Master Gardner’s demonstration garden at the Ft. Worth Botanical garden. It has not been labeled. I’ve been determined to figure out what it is. I’ve been successful tonight. Thank you for having this site. It has been very helpful. I have 2 of these plants that are failing….leaves drooped, balls turning brown and crisp. what to do to restore it to good health?? This is not a forum to ask questions. 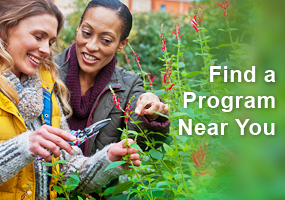 Contact your local Extension office and they can advise you on what the problem might be, since that can vary by location.